Meet Genos, Yamaha's flagship arranger workstation. Boasting unparalleled sample quality, cutting-edge styles, and pro-level connectivity, Genos defines the state of the art in songwriting and performance keyboards. With its large, crisp 9" LCD color touchscreen, assignable knobs and faders with their own OLED parameter status displays for real-time feedback, and a silky 76-note, aftertouch-enabled FSX keybed, Genos puts you in complete command, letting you instantly find and tweak the perfect sound or whip up a great-sounding arrangement in any musical genre. And the sounds are amazing, indeed. Yamaha's premium CFX and C7 concert grand pianos are jaw-dropping in their life-like realism. Recorded in world-class studios, Revo! 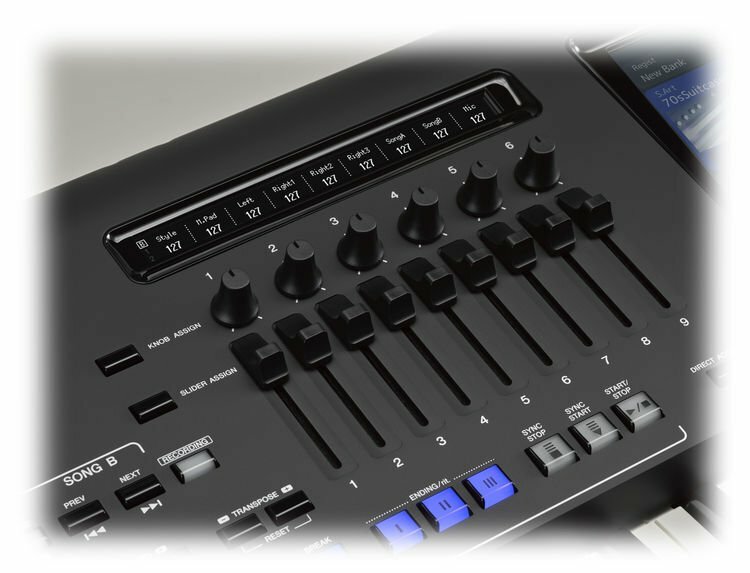 Drums leverage unprecedented multi-dynamic sample layers and round-robin wave cycling to deliver the most breathtakingly realistic MIDI drums ever offered in a keyboard. Non-keyboard instruments are superbly rendered by Yamaha's acclaimed Super Articulation 2 sound engine. All sounds benefit from multiple state-of-the-art effects engines. 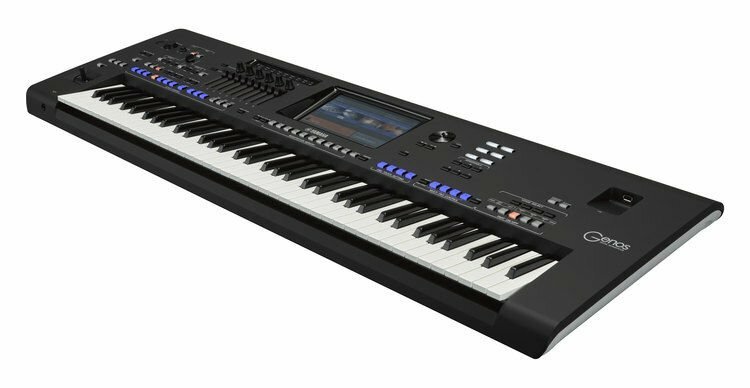 Topped off by extensive onboard MIDI and audio recording facilities and seamless DAW integration, the Yamaha Genos is the only keyboard you need to ace an important gig. The Ensemble Voices feature re-creates string, brass, and wind ensembles by intuitively mapping the instruments to their appropriate ranges for authentic-sounding ensemble performances. Previously, a Voice such as Brass Quartet would use a sample of four players. If you played two notes, however, you'd suddenly have eight players — which could be cool, but perhaps not entirely realistic. In Genos, Ensemble Voices always give you the same number of players because Yamaha designed into this instrument the musical knowledge of a professional music arranger. Play two notes with a Brass Quartet Ensemble Voice, and Genos will intelligently send the trumpets to the top notes and the trombones to the lower notes. We love it! Yamaha engineered Genos with enhanced DSP for a banquet of studio-quality effects that sound simply stunning. Included are meticulous models of coveted vintage rack and stompbox units as well as classic guitar and bass amps — all of which take full advantage of the gorgeous 9" TFT color LCD touchscreen with intuitive, high-definition displays that mimic the actual devices. These great-sounding effects include Yamaha's VCM (Virtual Circuit Modeling) — the very same technology as used by the studio-grade processing on the company's high-end digital consoles. When it's time to lay down a vocal, plug your condenser mic into the rear-panel XLR connector, switch on 48V phantom power, and you're ready to roll with a studio-grade signal chain the quality of which is unprecedented in a keyboard. As you layer your compositions, Genos will astound you with its ability to handle massive, lavish arrangements with poise and panache. A generous 256 voices of polyphony ensures there will be no note stealing. And with instant access to 1,652 instrument presets and 58 drum kits, you'll never run out of killer sounds. To quickly access your favorite configurations, Registration Memories provide an efficient way to save and recall panel settings such as Voice, Song, Pattern, and Style. Yamaha built Genos for songwriting and performance. The swoopy, dynamic visuals of its svelte chassis are quite alluring from the audience perspective; yet to the player, its clean, no-nonsense layout is designed for unfettered creativity. At Sweetwater, we see a lot of powerful keyboard instruments; with the Yamaha Genos, we definitely have a serious contender for "ultimate performance keyboard."